The country Nepal is probably most famous for that rather large hill they call Everest. Known to the locals as ‘Sagarmatha’, or ‘Goddess of the sky’. The thing they are probably least famous for is their killer death metal bands. Oh – and building custom motorcycles. As we recently learnt, there’s a reason for this. 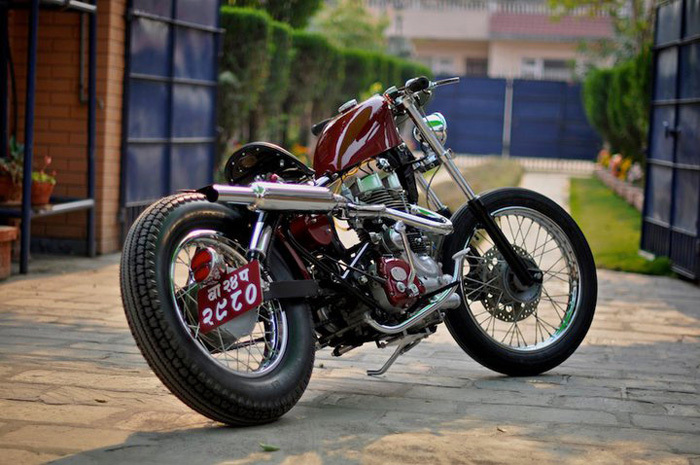 Any type of of motorcycle modification is strictly prohibited by the Nepalese Government. Not one to thrive living inside the rules, Sergey Egorov decided to chance it and build one of the first truly custom bikes in Nepal. This is the story about the bike named ‘Himalayan Outlaw’ or as we’d like to call her if we magically got naming rights, ‘Goddess of the street’.